The Prime Minister,Narendra Modi and the Prime Minister of Bangladesh, Sheikh Hasina fagging off the Kolkata-Dhaka-Agartala, Agartala-Dhaka-Kolkata bus service, in Dhaka, Bangladesh on June 06, 2015. The Chief Minister of West Bengal, Mamata Banerjee is also seen. 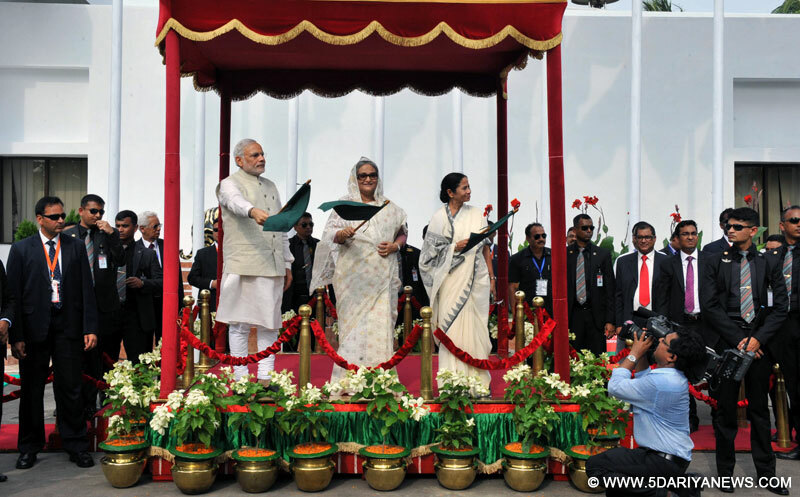 Modi reached Bangladesh earlier in the day on a two-day visit. He was received by Hasina at the Hazrat Shahjalal International Airport here.Upon his arrival, he visited the National Martyrs' Memorial to pay tribute to the soldiers who died in the Bangladesh Liberation War of 1971.In his second engagement of the day here, Modi visited the Bangabandhu Memorial Museum to pay tribute to the founder of Bangladesh, Sheikh Mujibur Rahman.India and Bangladesh will exchange instruments of ratification of the land boundary agreement later in the day.